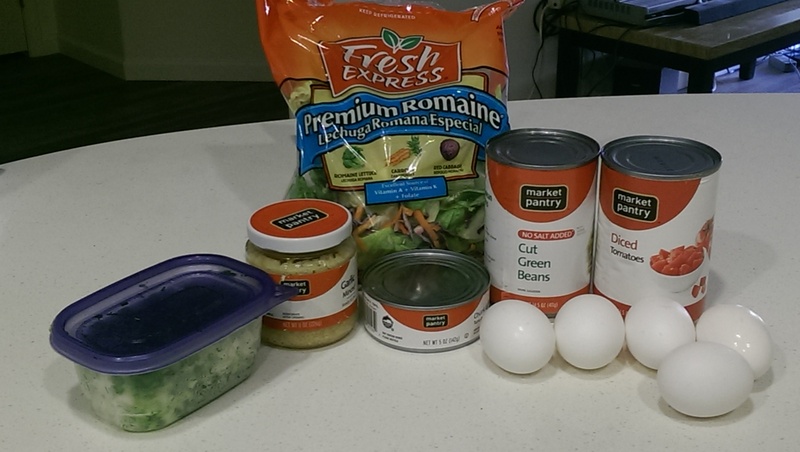 Below are the ingredients for this salad. Mostly French, it is easy, mostly nutritious, and tasty. For this recipe I decided to keep it as simple as possible. 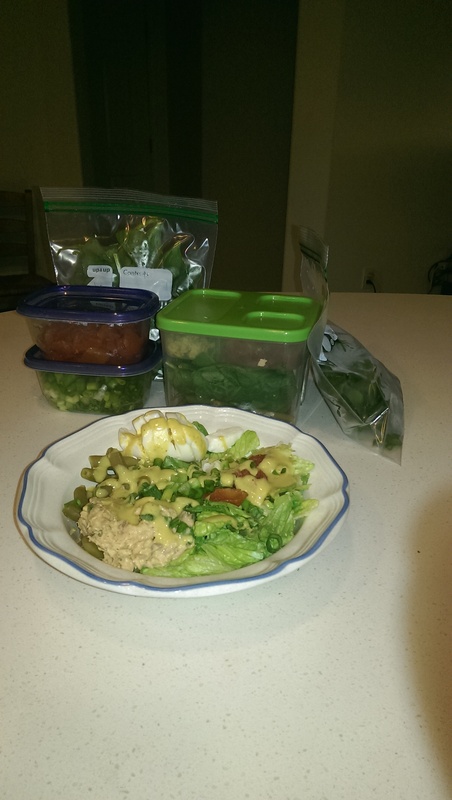 Canned green beans, hard boiled eggs, canned diced tomatoes, chopped green onions, tuna salad, garlic and lettuce mix. I hard boiled the eggs first, and while I was waiting on them, I mixed up some tuna salad. -one can of tuna. -one tsp mayo, two tsp Dijon mustard. -sprinkle liberally with green onions, and a half a tsp of minced garlic. -warm up the canned green beans in the microwave quickly. -Mix a portion of the ingredients on a plate. Only as much as you will eat. Cut up a hard boiled egg and add vinaigrette. BONUS: SALAD DRESSING RECIPE: TWO TBSP OLIVE OIL ONE TBSP DIJON MUSTARD ONE TBSP VINEGAR *I use Apple cider* ADD SALT AND PEPPER. Mix and match to taste preference. 🙂 -then combine tuna salad Also, remember to put everything away in Tupperware our freezer bags. They’ll retain their freshness longer and be available for all kinds of other recipes!